Employee recognition is the key to employee satisfaction. Employee recognition is a very effective and easily implemented, yet often overlooked strategy for improving employee’s satisfaction. 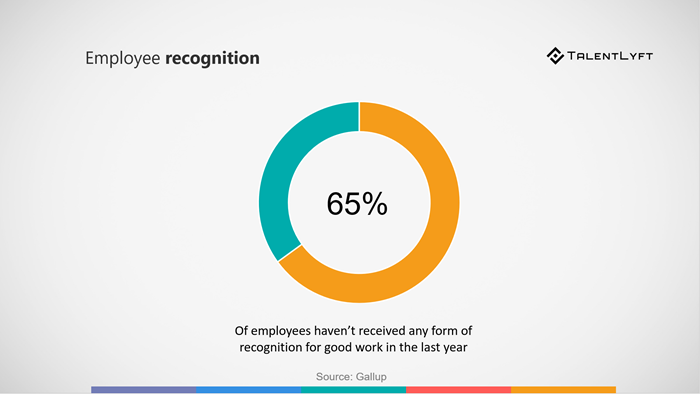 Only 35% of employees haven’t received any form of recognition for good work in the last year. Do you know that only half of the employees are satisfied with their jobs? The Conference Board's latest survey on job satisfaction has found that only 51% of employees feel overall satisfied with their job. This survey gauged approximately 1,500 employed individuals, who together comprise a snapshot of the U.S. workforce. 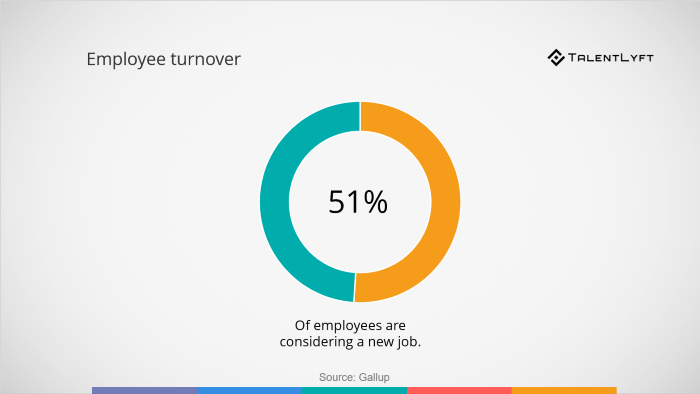 At the same time, another survey has found that 51% of employees are considering a new job. So half of the employees are unsatisfied with their job and looking for another one. This means that your company is in serious risk of losing your talent to your competitors. If your top performers leave to work for your competition, you will have to pay the high cost of replacing them. You will have to invest your money into attracting top talent, hiring them, onboarding and training them. Total costs associated with a turnover range from 90% to 200% of an employee’s annual salary, according to a report from the Center for American Progress. Even if your employees don’t leave your company, their dissatisfaction can negatively impact your company’s bottom line. Besides with high turnover, low employee satisfaction is also linked to low employee motivation, engagement and productivity, which leads to poor employee performance and lower profits. Luckily, there is an easy way to improve your employee satisfaction: employee recognition. Employee recognition is a very effective and easily implemented, yet often overlooked strategy for improving employee’s satisfaction. Before we dive into explaining the impact of employee recognition on employee satisfaction, let’s start by defining these terms. In order to fully comprehend the relationship between employee recognition and employee satisfaction, we should first understand what each of these terms means. Employee recognition is the act of acknowledging and appreciating an employee’s work. The main goal of employee recognition is to let employees know that the effort they put in their job and the work results they achieved are valued and appreciated. Many employers think that employee recognition is very costly and it has to include financial rewards, such as a raise, a bonus or at least a gift card. But this is not the case! 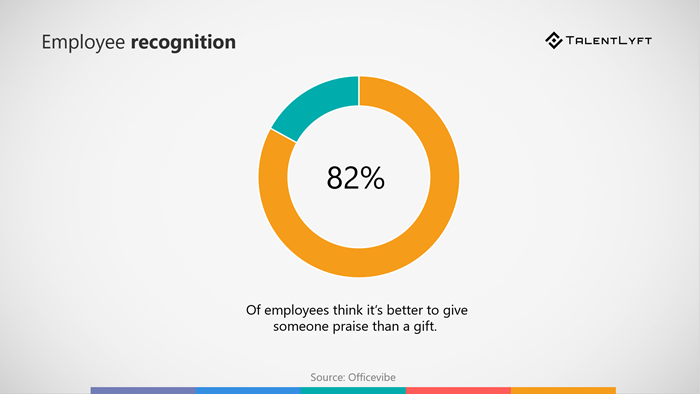 According to Officevibe’s recent study, 82% of employees think it’s better to give someone praise than a gift. Thus, employee recognition is simply showing your employees that you notice and appreciate their hard work. Employee recognition can be formal or informal. It can be aimed at an individual employee or a group of employees, such as the department of a team. In any case, it should always be timely and genuine. Employee satisfaction, sometimes also called job satisfaction, is the term used to describe the extent to which employees are content at work. Simply put, employee satisfaction describes how happy employees are with their job and their overall work experience. Employee satisfaction is one of the key HR metrics which has a direct impact on a company's bottom line. Satisfied employees are more engaged and productive. They are also more loyal and less likely to leave your company. This is why most companies try to stay abreast with their employees’ satisfaction. Most companies regularly track and measure employees’ satisfaction by using an employee satisfaction survey. There are many different factors that influence employee satisfaction. Work relationships (with colleagues and managers). According to empirical research, employee recognition, pay and benefits were found to have a significant impact on job satisfaction. The authors conclude that both financial and nonfinancial rewards have a role in influencing job satisfaction, which ultimately impacts employee performance. Thus, employee satisfaction occurs as a result of both financial and material factors such as compensation and benefits, as well as less tangible elements such as employee recognition. This means that employers can significantly increase their employee satisfaction even without investing a lot of money into providing larger salaries and bonuses and offering luxury benefits. Employee recognition is a very effective and easily implemented, yet often overlooked strategy for improving employee’s satisfaction. According to Gallup's analysis, only one in three workers in the U.S. strongly agree that they received recognition or praise for doing good work in the past seven days. Only 51% of employees feel satisfied with their job and the top reasons why employees leave their jobs is that they don’t feel appreciated, according to Gallup’ research. Luckily, employers can easily provide employee recognition and increase employee satisfaction. Recognizing employees doesn’t necessarily come in the form of large salary, bonus or expensive benefits. Most employees prefer the non-financial gestures that show the appreciation of their hard work. For instance, at work anniversaries you could invite your team to collaborate on a group ecard from Kudoboard to celebrate the special milestone. In a recent Gallup workplace survey, employees were asked what types of recognition were the most memorable for them. Respondents emphasized 5 methods in particular - and money isn't the only (or the top) form of recognition employees prefer. Start recognizing your employees’ hard work - right now! If you’re looking for effective, creative and low-cost ideas for recognizing your employees you can start implementing today, check out our brand new blog post: 20 Ideas for Employee Recognition Programs!